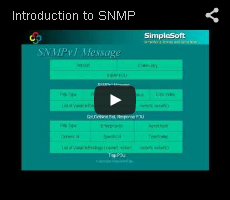 SimpleSnmpTcl is an easy to use Tcl package that provides a set of application commands to communicate with a network management agent using the Simple Network Management Protocol (SNMP). It supports all versions of SNMP (v1,v2c and v3). It also supports IPv6 in addition to IPv4. Using this package, you can quickly create standalone management applications that use SNMP to retrieve and configure information on agents. A trap interface is also supported. The document includes sample scripts that can be used as templates to create your own applications. The package uses the 8.4 version of the Tcl interpreter on Red Hat Enterprise Linux and versions 8.5 or 8.6 on Windows. Receive Traps/Event notifications from agents.